How can I change/stop an existing payment plan for one participant or the entire trip? Learn how to stop and/or modify any payment plans set up for your participants. If you need to change the payment plan for a participant, you first need to stop the current plan. You can do so in "My Trips" → "Manage Trip". There, click on "View Payment Plan" in the menu next to the participant (the icon with the three dots). Click on "Stop Payment Plan". This will send a notification to the user that you have stopped the current payment schedule. What happens to the outstanding installments when I stop a payment plan? The sum of all the outstanding installments of this user will still be shown as "balance due" and our system will stop sending the automatic payment plan reminders. At this point, you can set up a new payment plan for this user. Note: If you also want to change the price for this participant, prior to setting up the new payment plan, you should first click on "Set Custom Price" to adjust the overall trip price for this user. Then, you can proceed with setting up the new payment plan. After you've stopped the old plan and possibly adjusted the price, simply add the new payment plan for this user as described in this article about setting up payment plans. Once you've added the new payment plan, you've successfully updated/changed the payment plan for the participant. 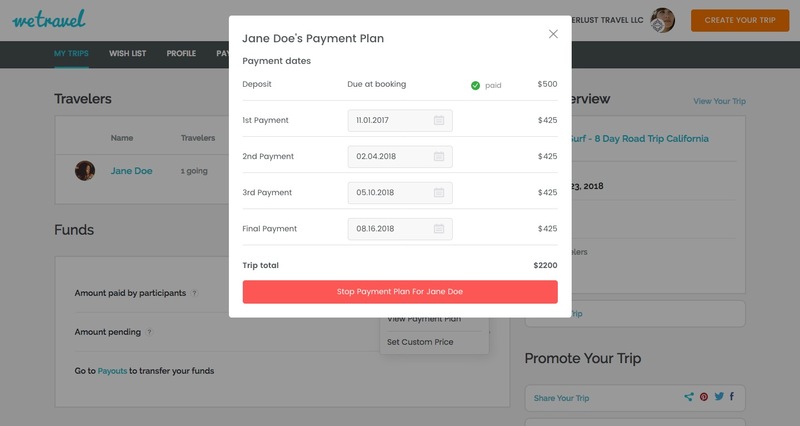 If you need to change the payment plan for all new participants joining your trip, you can simply do so by editing your trip. Go to "My Trips" --> "Edit Trip" then to the "Pricing" tab in the trip builder to change your payment plan. Remember to press "Publish" after making any changes. Note that any change will ONLY affect new bookings. Existing bookings will still have the payment plan schedule that was in place when the participant signed up.